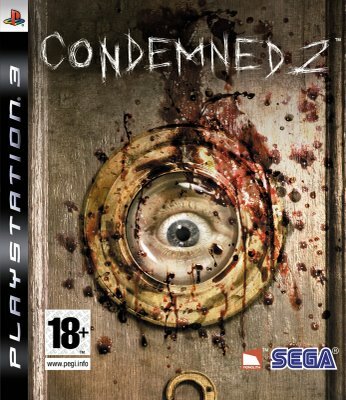 Condemned: Criminal Origins was a curiously unique piece of work. Simultaneously commercial and entirely niche, it blended abject horror, gritty combat and oppressive atmosphere with forensic science, Greg Grunberg and an unnecessary leap into the supernatural. At its peak, Criminal Origins felt like an interactive Se7en, following the journey of a fragile cop into the twisted mind and sickening accomplishments of a serial killer. However, the studio’s confidence in this excellent premise faded, leaving the draft plunge into surrealism at the game’s climax spoiling an otherwise impressively cogent adventure. With Bloodshot, it appears Monolith may have abandoned the maturity of the original. Protagonist Ethan Thomas, once styled on portly Heroes Star Gurnberg, has now been remodeled as what can only be described as ‘emo vagrant’, mixing a trendy haircut with blood –eyes and tattered clothes. He’s lost a few pounds too. Thankfully, Thomas pugnacious attitude hasn’t deserted him, ad you’ll be happily clouting destitute weridos with all manner of leap pipes, axes and misshapen pieces of firewood. But where Criminal Origins used its combat as a means of telling its story, Bloodshot is pushing it to the fore. The intense atmosphere will remain and the aggressive and cruelty of the experience will be ever present. Whereas Criminal Origins simply presented its violence, Bloodshot revels in it. Keen not to lose all senses of purpose, Monolith has completely revamped the forensic investigation. In Criminal Origins, it acted as little more than a semi-scripted segue between all the brutality, but Bloodshot has made everything that more organic. You’ll have to use the correct tools, locate suitable evidence and examine every minute detail in order to solve the crime scene’s morbid mystery. Let’s hope that Monolith finds a suitable balance between combat, horror and investigation so that Condemned 2: Bloodshot can truly progress from its predecessor.